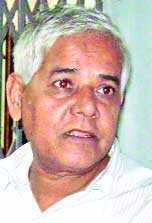 Rabindranath Sarkar was the victim of land-grabbing by Sohel Rana. It was on the land that originally belonged to Rabindranath Sarkar that Rana Plaza was built. Amitash Pal reporting from Savar. Translated from Bengali for AlalODulal.org by Tibra Ali. These words were being spoken by Rabindranath Sarkar. It was land illegally grabbed from him on which Sohel Rana, joint convenor of Savar unit of Juba League and the former general secretary of Savar Chhatra League, built his multi-storied “Rana Plaza”. Mr. Sarkar’s business, “S. S. Sarkar Brothers” (address: Kashrubagan, 39B Majidpur), is right next the wreckage of Rana Plaza. It was there on Saturday afternoon that this reporter spoke to him. During the interview his face was stricken with fear. He was reluctant to say anything. He was trying to avoid the topics of Sohel Rana or land-grabbing whenever they came up. Previous Jonaid Naim: Shoot me to death. My Oxygen is finished. 2001-2013. Both BNP and AL assisted this Sohel Rana. Not necessarily someone has to be a Hindu or from minority commnot rareunity land grabbing by powerful elements are rare in our country. Statistics tell Awami League leaders have been the greatest beneficiary of this exercise. Goverment machinery are always glad to help the powerfuls. I know many Muslims who had the same experience. Their faults were they were weak and had no special connection with the powerfuls. Poor guy. Justice and restoration to him. I got confused with the percentages. did the translater mean decimals of land? the production of sohel rana, brac bank and the Awami leagues dealings with him need to be investigated. Thanks fustar, it should have been “decimals”, not “percentages”. Agree w/ fugstar, except with one addition: Awami League and BNP dealings with him. Look at the years of his rise, and you’ll see that the Sohel Rana’s come out on top in every regime. The core problem is gangster capitalism married to thug politics, in which both AL and BNP participate equally. the absence of a good governance has been exposed… like Rana, there are thousands more who take the bold move to exploit people by illegal ways and this is mainly happening due to the absence of adequate law enforcers or because of corruption. Taking law into their own hands by bribing, lobbying or blackmailing etc. the criminals exploit own country as a hunting ground without any obstacles. These AL and BNP terrorists and criminal gangs must be brought to justice or the chaos won’t leave this country.